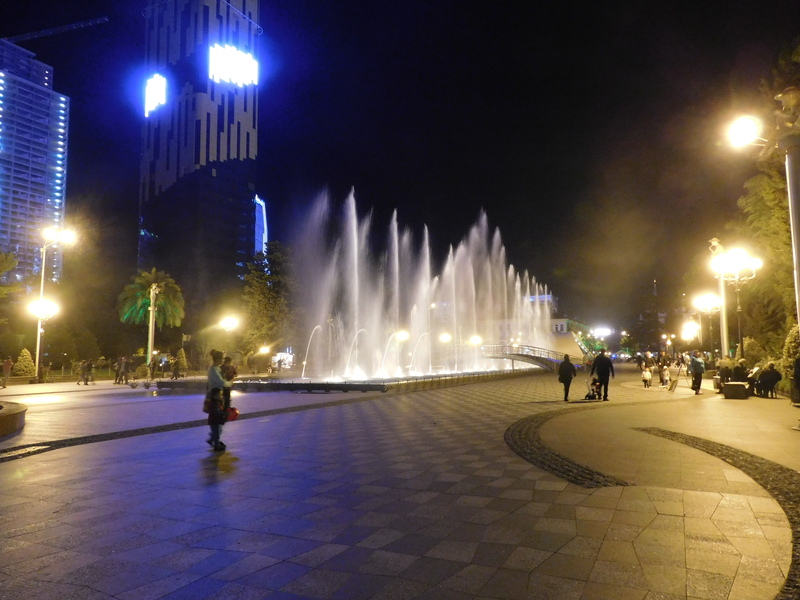 This post is a continuation of my first one on Georgia, Exploring Batumi. Rested up with a little bit of Georgian wine in our tummies, we headed out for dinner at the House of Batumi, a little restaurant that had excellent online reviews. Everyone had written that you MUST get the eggplant appetizer, so we did, and it was absolutely delicious. This followed by the most delicious soup I have ever had. I think it was a version of kharcho which I’d like to try my own hand at. 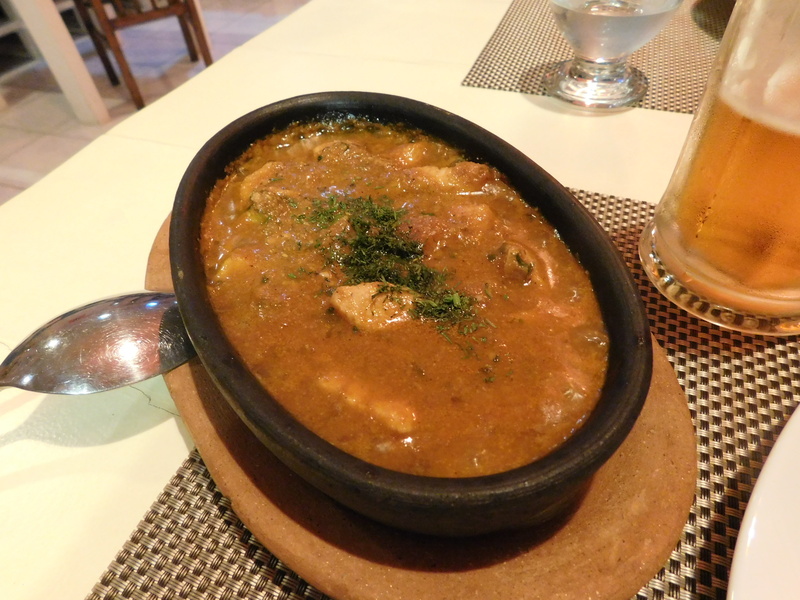 After the kharcho, we had several fragrant stews with chicken, walnuts, and fragrant herbs, all extremely delicious. (Go here if you visit Batumi, just ignore the kitschy decor!). 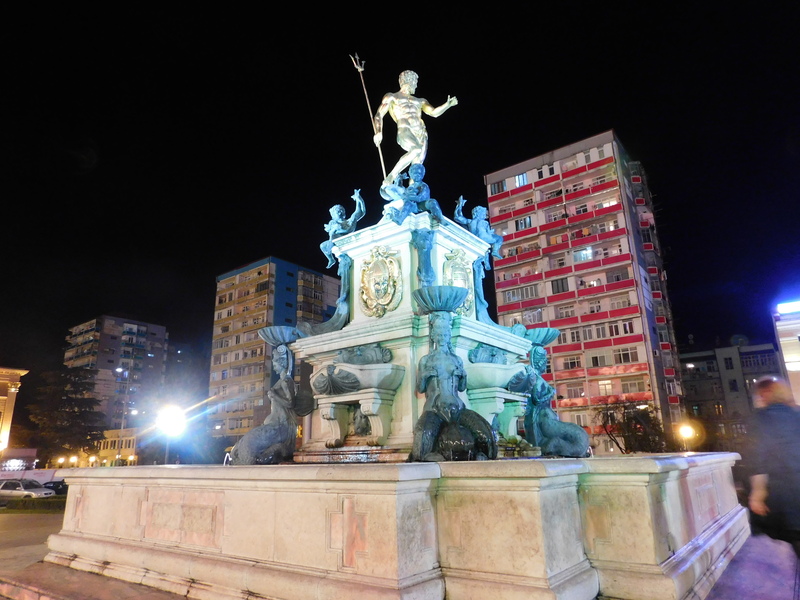 Afterwards, we headed out to check out the Batumi nightlife which centered around shiny-looking casinos, seedy so-called Turkish bars, and everything else. We enjoyed the everything else part which included strange statues, a fountain show set to classic rock, and a little boutique chacha bar. 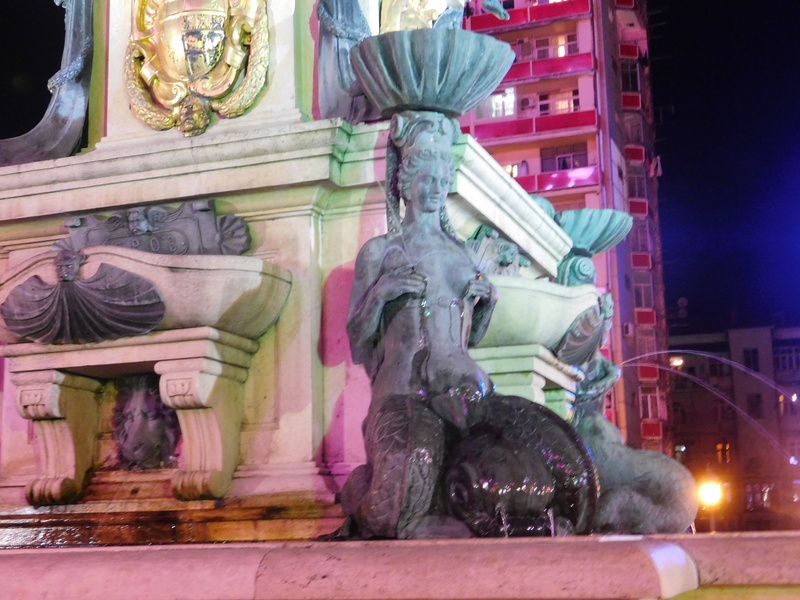 Here is one of the delightfully strange statues of Batumi we found that night. From afar, it could be mistaken for a typical classical-inspired statue, but look closer. Amidst the glowing casinos, I believe I saw another strange figure, a pig head. The fountain show was pretty fantastic, but it seemed to be a big production for the handful of people who were out that evening. Nearby, a group of Turks had brought a stereo and were dancing the halay, that is, until they were asked to leave by the police. I guess exuberant dancing in public places is really only acceptable in Turkey. 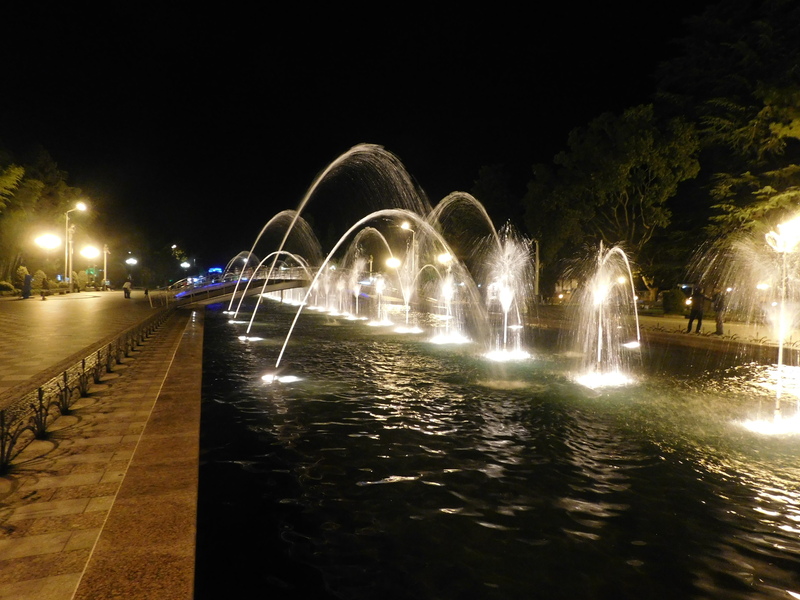 Besides the halay, the Batumi night was very quiet, almost eerily so. After stepping into a souvenir shop for khinkali and khachapuri-shaped magnets (essentials, right? ), we found ourselves back at Chacha Time. We had seen the bar earlier in the day, and we had pegged it as a fun place to pass the evening. I thought maybe the owners liked to do the cha cha or something, and that’s where it got its name, but the truth was much, much better. Chacha is a type of Georgian grape brandy or vodka, and at Chacha Time all the drinks were mixed with this lovely Georgian specialty. The four of us started out with the lighter cucumber chacha drink which was recommended by Konstantine, our amazing bartender, who thought we should take it easy since we were not seasoned chacha drinkers. From there, I tried the chacha with tarragon, a type of herb often used to flavor soda in Georgia. It was too green for me and a bit strange, but altogether, a new taste, and therefore, a good experience. The guys, opted for the chachita, and when we asked Konstantine what was in it, he slyly said it was made with the ‘soul of the bartender.’ That thing definitely packed a punch, and I guess that’s what the real chacha drinkers enjoy. We sat at the bar that evening and asked Konstantine and server Pavlos who was Greek but had come to Georgia for work all sorts of questions. They were extremely engaging, willing to share about their experiences living in Georgia, and I think we all left with a bit more insight. Konstantine also sent us on our way to Shemoikhede, his favorite dumpling place in Batumi. And that is how we found ourselves in a very local eating establishment having our second helping of khinkali that day. When the servers saw us walk in, they sent over a Russian speaker to help us, but that did us little good, and we struggled a bit to place our order for khinkali and another plate of khachapuri for good measure. More cheese, dough, and butter! This time we knew how to eat these little balls of magic. Eat the dumpling with your fingers, letting the juice run into your mouth, and leave the topknot. Waking up on our last day of Batumi was bittersweet. I wanted to stay much longer, traveling throughout the countryside, and heading to Tbilisi for endlessly delicious food, wine and culture. We were, however, weighed down with our wine purchase, and our obligation to make our Sunday evening flight out of Trabzon. So, we decided it was time to give Rolanda a call to ferry us back to the border crossing. Rolanda showed up in his boxy black taxi. We loaded in and carried on in Turkish about our weekend. Just before reaching the border, he swerved into oncoming traffic and pulled over to the other site, which voila, was where his house was located. He invited us in, and we couldn’t decline. Inside his wife had already set the table with persimmons, apples, biscuits and small candies. She served coffee in demitasse cups, which he followed by bringing in a pitcher of homemade wine, pouring one very large glass for each of us. We declined a second glass, and then he brought out some homemade vodka, insisting that we try that, too. Georgian hospitality, like Turkish hospitality, knows no bounds. With some persuasion, Rolanda allowed us to be on our way. Back at the border, we made a smooth border crossing except for a moment’s hesitation when my passport failed to scan, and throngs of black-clad Georgian women behind me started to get impatient. The guard finally got it to work, and we found ourselves back in the land of the Turks. For Georgian recipes, read Darra Goldsten’s The Georgian Feast. Oh my God the fooooooodddddduuuuh! That looks so good!! I love how the driver took you on an unexpected detour lol. In America that would be creepy as hell , but it’s all good around here!